Sheldon J. Plankton, owner of the Krusty Krab’s rival restaurant the Chum Bucket and primary protagonist of the SpongeBob SquarePants show is a wealth of valuable life lessons for young viewers. Here are ten of the things that children can learn from the behavior and character of Sheldon J. Plankton. Friendship is More Important Than Money – Watching Mr. Krabs and Plankton fight so bitterly after years of friendship can help kids see that relationships can be ruined by greed, an that friends have a far greater worth than material wealth. Professional Obsessions Can Ruin Your Personal Life – Because of his fixation on stealing the Krabby Patty recipe and the extent to which his life is dominated by the quest, Plankton’s personal life is somewhat lonely. He’s married to a computer, though neither of them seem overly impressed by one another and he lives in the failing restaurant he runs. Being Rude Doesn’t Get You Anywhere – Plankton’s restaurant, the Chum Bucket, certainly suffers due to the disgusting quality of the food; however, another problem lies in the fact that Plankton is consistently rude to any customers that do visit. Kids watching understand that treating people with disrespect doesn’t help a person make friends. Family Can Be Embarrassing – It’s one of life’s indisputable truths: family can be embarrassing. When Plankton enlists the help of his enormous family to help steal the Krabby Patty recipe, he learns that they’re mostly uneducated and ignorant, much to his chagrin. A Simple Mistake Can Have Huge Repercussions – Sheldon J. Plankton’s video game persona in SpongeBob SquarePants: Battle for Bikini Bottom makes a very simple mistake that leads to chaos; he forgets to switch the robots he built from “Do Not Obey” to “Obey.” Plankton’s oversight can help kids understand that attention to detail is very important. Persistence is a Virtue – Though his goals are less than honorable, the dogged determination with which Plankton approaches them is quite admirable. Kids are often told that they should never give up; with Sheldon J. Plankton, they see this behavior in action. Roles Can Reverse – In the earliest SpongeBob SquarePants episodes, Plankton was the clear-cut antagonist. Over time, his rival Mr. Krabs has become more greedy, while Plankton’s outright villainy has diminished. As a result, kids who are regular viewers can see that a person’s personality and reputation can change over time. Cleanliness Makes a Difference – In addition to the poor food quality and a refusal to be polite to the customers, the Chum Bucket can also blame its lack of success on the fact that it simply isn’t clean. For kids, seeing that dirty places are off-putting can help them understand the importance of cleanliness. Knowing Your Weaknesses is Half the Battle – A contributing factor to Plankton’s consistent failure to obtain the Krabby Patty recipe is a complete lack of self-awareness. His overly-confident approach often foils him, helping kids understand that it’s important to know your own strengths and weaknesses. Breaking the Law Has Consequences – Legal action against a cartoon antagonist is relatively rare; however, Sheldon J. Plankton has found himself on the wrong side of the law more than once during the run of the series. The fact that he is arrested as a result of his schemes can help kids see that there are actual legal ramifications to choosing not to adhere to the law. 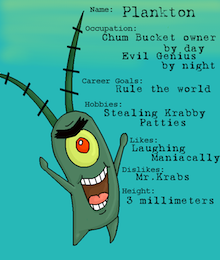 Plankton has always clearly been one of the ‘bad guys’ in Bikini Bottom and his schemes never work. In the ongoing war of good versus bad, he definitely gives a good push towards following the direction of good and right.